While visiting the beautiful city of Indianapolis last week for a basketball game between our beloved Seton Hall Pirates and Butler, we made an unexpected stop at the “9/11 Memorial”, that had been erected in the middle of the city. Suddenly and unexpectedly, the events of that morning more than fifteen years ago engulfed my consciousness. The memorial is exquisite, recounting each detail of the dramatically devastating event that was 9/11. The sky in Indianapolis was a brilliant blue with angel-white fluffy clouds; eerily reminiscent of the 9/11 sky, when I became an unwitting witness from my onboard window seat of my continental flight, as it soared northward from Newark Airport, en route to Providence. 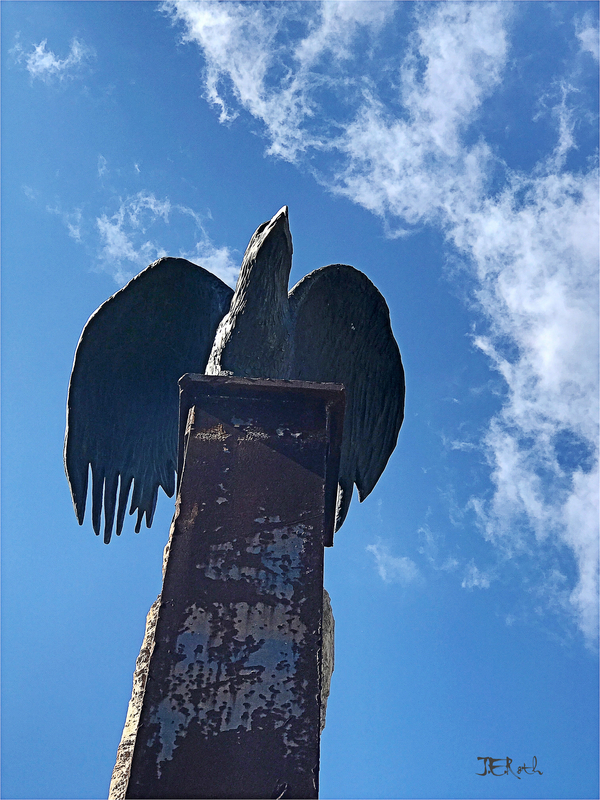 This photo attempts to capture the awe-inspiring vision of the centerpiece of the Memorial: a life-sized American Eagle sculpture, perched atop a structural steel beam, recovered from the World Trade Center. The sight of the eagle…that huge, life-sized eagled, on top of the beam, was breathtaking, as was the rest of the outdoor memorial, which had commemorative monument stones marking each time stamp of each crash. It was so moving, as that day in Indy, we had filled our heads with basketball and race cars. These are seemingly unimportant on the face of 9/11, but then realizing that’s what it is all about. Our American way of life, the important and trivial things that decorate our lives, survives, strong and defiant, like the eagle! Love you, dear Sister.